Home Articles Use Kinesiology Tape to Treat and Prevent Ankle Injuries! Kinesiology is the study of human movement. Kinesiology tape works by supporting body movements to promote healing and prevent injury. Ankle injuries are one of the most common and devastating injuries professional athletes endure. They can occur anytime, and may require weeks or months of rest before completely healing. You can prevent ankle injuries by using high-quality, high-performance kinesio tape such as TT TARGET TAPE®. With proper application, this tape can also boost the healing process. Not all tapes offer the same high performance. TT TARGET TAPE is flexible and breathable, so it will not decrease or restrict the range of motion—an important factor for professional athletes. Ankles Come With Lots of Breakable Parts! Sprains and fractures are the most common ankle injuries. It’s important to understand why an ankle injury can be so devastating to an athlete. An ankle sprain affects the ligaments, which attach the lower leg bones to form the ankle. Ligaments also support and stabilize the ankle. They are used, repeatedly, for nearly every activity. Tendons inside the ankle attach lower leg muscles to the bones. 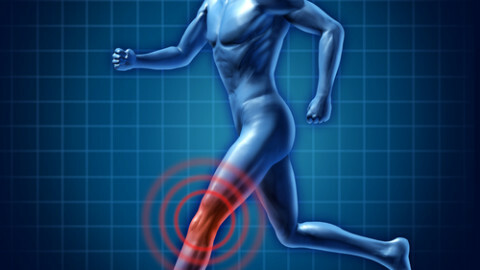 They also cushion the joints to aid in shock absorption when a person walks, runs, jogs, dances, or engages in any activity that requires leg movement. An ankle fracture involves a break in one of the lower leg bones. This requires extensive treatment and often, physical therapy as well. It is important to follow the traditional RICE method— rest, ice, compression, and elevation—when treating any kind of ankle injury. With ankle injury, swelling can quickly become extreme, which actually can slow the healing process. 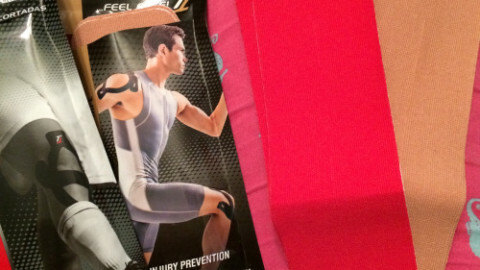 Combining RICE with kinesiology tape can dramatically speed up the healing process. TT TARGET TAPE lifts the epidermis, or upper layer of skin, to create space between the dermis (middle layer of skin) and muscle beneath it. This relieves pressure on the lymph channels so fluids can smoothly flow to and from the injured area. Creating this space also decreases pressure placed on the nerve receptors in the area between the dermis and the muscles. Our tape will stay in place for up to 72 hours after application. Because it’s also water resistant, it won’t sweat off. You can even shower and swim with the tape. It will remain intact and not peel or loosen. Kinesio tape can also prevent ankle injuries. The extra space it creates helps muscles contract more efficiently, so muscles and ligaments do not become fatigued even after long periods of exercise. The tape also improves joint alignment and mobility, a major improvement in injury prevention to vulnerable areas like ankles. This helps improve athletic performance levels as well. Once an athlete becomes comfortable with the tape, s/he will relax more and focus on performance. Our customers trust our tape and credit it with helping boost their physical and mental capacities. If you are a professional athlete or just like to work out, try our TT TARGET TAPE for yourself. Be sure to take the time to educate yourself on the application process, so you can receive all its wonderful benefits. Check out our videos that show how to apply the tape to different parts of the body.